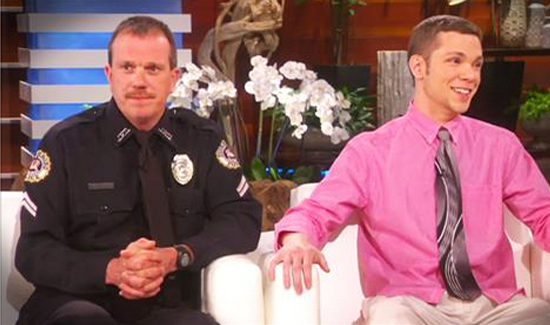 A Jonesboro, Arkansas, police officer and a young student got quite the surprise from talk show host Ellen Degeneres. According to THV11, student James Taylor was walking home from his job at McDonald’s when off-duty Officer John Shipman saw him. It was nearly 3 a.m. and 19 degrees outside, so Shipman offered him a ride home. The next day, Officer Shipman started a Facebook page to get donations to buy Taylor a car for his daily hour-long walk to work. After just a few days, he raised $7,000. On Monday, Ellen surprised them both with a little money of her own. She gave Taylor a $20,000 check, and also gave Officer Shipman a $10,000 check.